I thought for this review I would try something different. I have broken this review up into sections. I am hoping this will help me structure my reviews a little bit more. 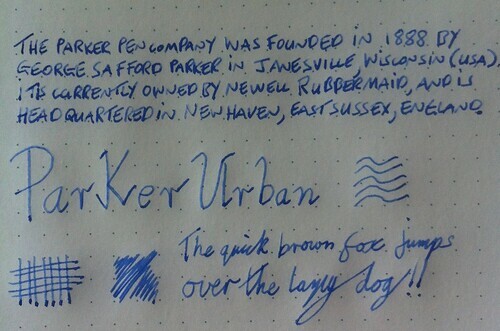 I really like the design of the Parker Urban as it looks like a hour glass figure. From the area that you would hold it curves in and out towards the end. I find this makes it very comfortable to hold as it fits nicely in my hand. The Parker Urban is made from Brass and has a black lacquer finish which makes it look a very smart fountain pen. There is an added touch of chrome plated trim that adds to the look. The clip is pretty sturdy and has a nice leaf style design incorporated. Due to the fact the main material here is Brass you can expect the Parker Urban to be pretty weighty and it doesn’t disappoint! I compared it to a similar priced fountain pen, the Lamy Safari and the Parker Urban feels like it weights four times as much. I know this really isn’t a fair test as the Lamy is a plastic material pen but its the only similar priced fountain pen I have. Without the cap it is 12.4cm in length. With the cap posted it is 15.3cm in length. I do find the best writing experience to be with the cap not posted as it feels the most balanced then. With the cap posted it feels top heavy. I am just using the standard parker cartridge (Blue) that comes free with it. I have to be honest here, I hate the quality of this cartridge. The colour is so washed out and the consistency of the depth of the colour is very poor. Certain areas of my writing looks stronger in colour that other. You can purchase a converter for roughly £4.00 from any good retailer and I would really recommend this as it means you don’t have to use the Parker cartridge. This is a stainless-steel nib that is only available in a Medium which I find a tad bit disappointing. 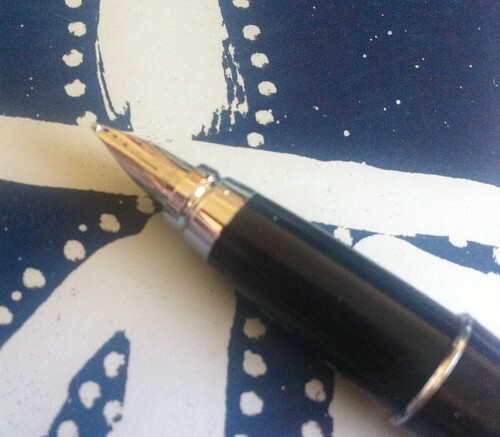 The nib is partly covered by a piece of chrome plated trim and this reminds me a lot of the design of the Parker 51(Could this be a deliberate node to the classic design of the Parker51?). The writing experience has been good if a tad bit inconsistent in ink and line width. It is a very smooth writing experience and I haven’t felt any feedback while writing. I actually got mine off eBay for less that the £24.42 that most retailers charge. I think I paid £11 give or take a few pounds. I really do recommend that if you are going to buy the Parker Urban that you invest in the converter as I do believe the cartridge does hold the fountain pen back from being a good one. All way through Primary and Secondary school I used a Parker fountain so the Parker Urban reminds me of my journey into the world of fountain pens. I have enjoyed using it and I need to get a converter ordered.